There's a room in our new house that Simon and I love to hang out in and spend most of our time. The office! Not being able to agree on the set up and refusing to share we ended up opting for a desk each which is a pretty fantastic setup. It allows us to spend the evenings together, me sitting at my blogging desk frantically typing away and him sitting at his desk gaming with his friends. 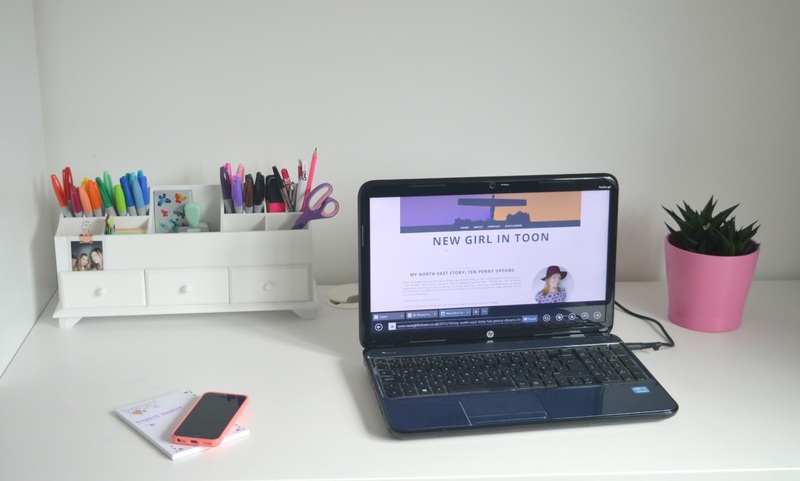 My blogging desk is my pride and joy and I love gathering bits and bobs to make it pretty and functional. I'm a definite office geek and it's great having a little space in the house that's all mine. My latest obsession is my new organiser from Qwerkity, a site full of the most fantastic gift ideas when you want something a little fun and different. 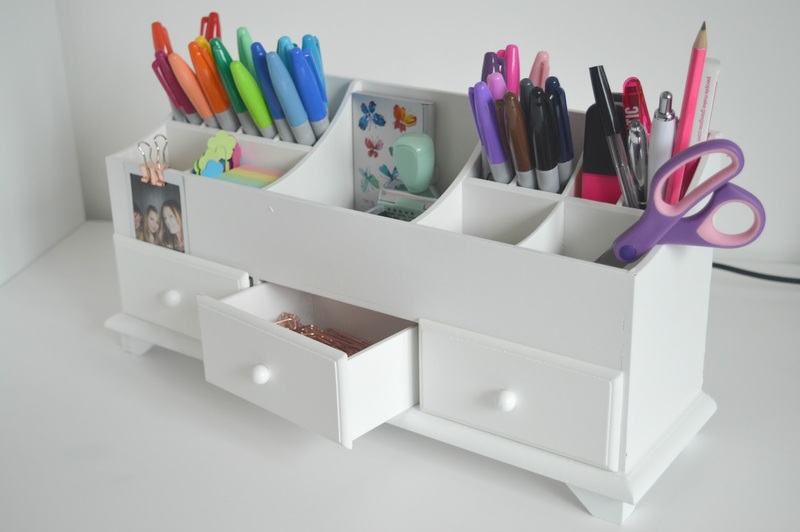 Made of white wood and featuring three little drawers and thirteen different sized compartments I've had great fun stuffing this full of stationery. Giving me the perfect excuse to go on a massive haul in Smiths and Paperchase (I may have gone overboard with the coloured Sharpies and did I really need those rose gold paperclips?) I now have pretty much anything I could ever need in easy reach. I have to admit I'm spending quite a lot of time just gazing at my desk organiser, there's something about seeing all my stationery together in one place that makes my geeky heart sing with joy, I'm also quite smug about how beautiful and tidy my desk is looking when Simon is frantically scrabbling around his work area for a pen. With Christmas approaching why not sneakily leave the gifts for her section of the website open on your computer! Let me know if my new desk organiser fills you with as much geeky joy as it does me! Those Sharpies though! Did you get the ultra mega pack of them from WHSmith's? I'm currently using mine for anything and everything. Beats writing in boring blue and black. A little bit obsessed with the rose gold paperclips too - they're gorgeous. There was a great deal on at Smiths - buy any two bits of stationery (including cheap own brand) and get a giant pack of Sharpies reduced from £16.99 to £6.99 .. couldn't resist! Ooh tom has just said I can have his spare room as an office space so I'm looking at decor ideas. This couldn't have come at a more perfect time! So cute that you both use the office - I'm too much of a loner, I'd have to boot him out so I could have my own little haven! AMAZING!!! I will admit there are times that I want to boot Simon out, when he has his headset on and he's on a mission with his friends they get very loud and over excited! I hink I need one of those in my life too! 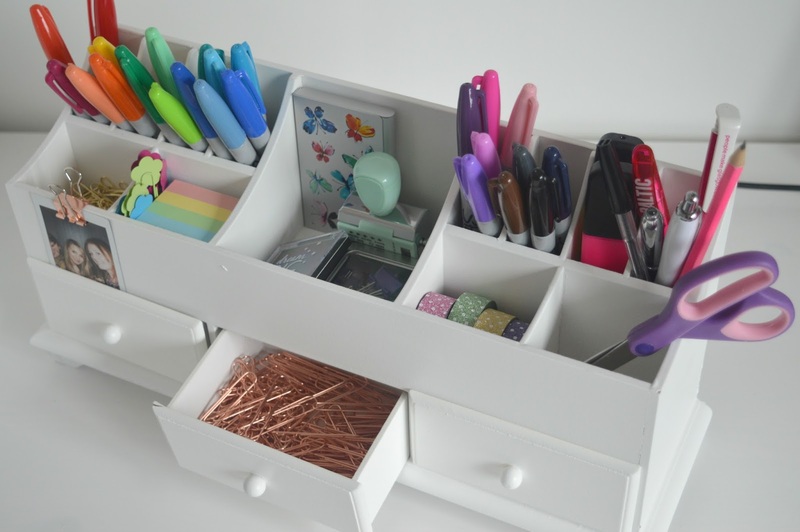 It looks like the perfect desk organiser. I am also addicted to Paperchase too. It's my secret obsession. Definitely! I kinda want another one! OMG having it at work would be brilliant ... mmmmmm maybe I should get another one for work?! I am really enjoying using them, I've just drawn up a schedule for my deadlines and used different coloured pens .. heaven! Aaaaah! This is like a window into my future, when we get an office so I can sit blogging in an evening whilst Rich games with friends. I think as that is so similar it means I *have* to get that organiser and alllll the stationery too to put in it. Totally jealous of all your Sharpies, and the washi tape! Desk inspo!